It was a warm August afternoon in south Monterey County. I was pretty sure I knew where I was going as my friend and I meandered down a quiet road south of King City. I was on a quest – to discover The Valley of Our Lady. Following a little talk with his superior, we were permitted to go as far as we wanted, and found The Valley of Our Lady. I could not, however, find the giant oak tree – an important and highly symbolic part of John Steinbeck’s early and highly metaphysical novel To A God Unknown. I concluded that Steinbeck must have just made it up. Or else the tree had been cut down, or had been burned, or otherwise destroyed. I was just thrilled and convinced that I had, indeed, found The Valley of Our Lady. I remained convinced until I met Timothy Bottoms a year later at the Steinbeck Festival in Salinas. That’s when I learned that – if I had gone farther (a lot farther) I might have met Timothy sooner and found the real Valley of Our Lady. He owns it! You’ve seen Tim and his brothers (Sam, Ben and Joseph) in scores of movies and TV shows. Tim played Adam Trask in the TV mini-series East of Eden. Sam played his son Aron in this semi autobiographical epic novel by John Steinbeck. Both Tim and Sam are featured in the East of Eden exhibit at the new National Steinbeck Center in Salinas, located two blocks from where Steinbeck was born and raised. Tim is no stranger to Steinbeck Country. He was 12 when he climbed up a hill and shot a buck that, he says, “was about as big as I was,” over by the Avila ranch near Los Padres. He was sitting on the ridge dressing out the deer when the clouds cleared over the valley below. Sunlight flashed on a house. He thought he heard a rooster crow. Something clicked inside him. A magical mystical feeling swept over young Timothy Bottoms. He managed to get the deer back and gave it to the caretaker of the ranch were he and his family were visiting. The old man told him how to get down into the magical valley. So, he got on a horse and took off. Sitting in the sunlight on the porch of the house sharing a candy bar with a white chicken, a starving white cat appeared and polished off the Baby Ruth. Tim looked around. The doors were open. There were bullet holes in the wall. Junk all around. And sixth grader Timothy Bottoms thought it was the greatest place in the world. That was the early 1960’s. During the following years, his family continued to vacation and play at the ranch nearby. Tim would depart and visit “his” ranch in the magical higher valley. The cascading green of Big Sur area of California’s coast lay just up and over the high mountains that bordered the valley to the west. In 1971, Tim and his brother Sam made a movie called The Last Picture Show. Shortly after that, Tim was back in his valley. He’d never seen anyone there. Now, however, he saw what appeared to be the owner’s name on a paper in a garbage pile. He’d made some money on the movie. He wrote the man a letter. There was no reply. So, he went back to work making movies. Timothy Bottoms’ best birthday present that year was a letter from a realtor in King City. offering him an opportunity to buy his magical place that was also John Steinbeck’s literary locale more than 40 years earlier. 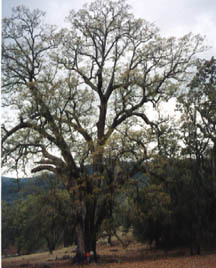 The giant oak tree is there – the size of a sequoia. So is the spring that “…flows over the mossy covered rocks.” The mystical glade, the Indian trails over the peak to Big Sur where “The Seer” lived in John Steinbeck’s second novel: To A God Unknown. 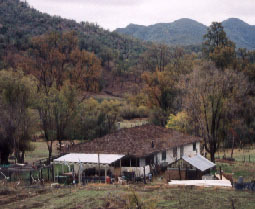 Dating back to the 1760’s, the ranch has had several names. Vincente Avila called it Salsipuedes (Get Out if You Can.) That was also the original name of the San Antonio River’s south fork. Timothy kept the name. He also knows it has another special name for Steinbeck fans around the world. It is The Valley of Our Lady.